To defrost the rear window glass and outside mirrors (if so equipped), start the engine and push the rear window defroster switch on. 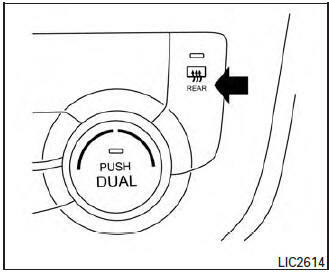 The rear window defroster indicator light on the switch comes on. Push the switch again to turn the defroster off. The rear window defroster automatically turns off after approximately 15 minutes. When cleaning the inner side of the rear window, be careful not to scratch or damage the rear window defroster. NOTE: The top and bottom few rows of wires on the rear window are not part of the rear window defroster system. These wires make up the antenna for the audio system.